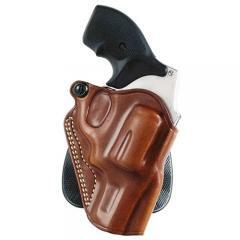 Speed Paddle Holster is constructed of premium saddle leather and features an open top design, covered trigger guard and tension screw adjustment. This paddle holster also includes Galco's patented copolymer injection-molded belt lock paddle, which makes it possible to put on and take off this holster without removing your belt. This holster broke in very nicely after viewing the Cops Plus video on how to break in a new holster. Excellent option for concealed carry off duty. I conceal carry but have to remove it when entering my work place. I needed something easy to take off and put on before and after work. I prefer leather and this paddle holster by galco has been the ticket for me. Quick on and off, rides good, so far no complaints. Also I am using it fo a rossi 461 357mag. It seems to be hard to find holsters for this model and brand. It fits well, as long as it doesn"t strech too much over time. If you have the same or similar needs in a holster I would recommend this one. Good construction. fits my 2.5 inch k frame perfectly. order process and delivery was very smooth. looking to fit the model 66 2.75" barrel, any suggestions for a high sided holster? You can select "Smith & Wesson K Frame 66" for your fit. Any Revolver listed in the dropdown menu for this holster. How do I get my 10.00 NRA member discount? Each Galco product comes with a voucher for 10 off NRA membership.